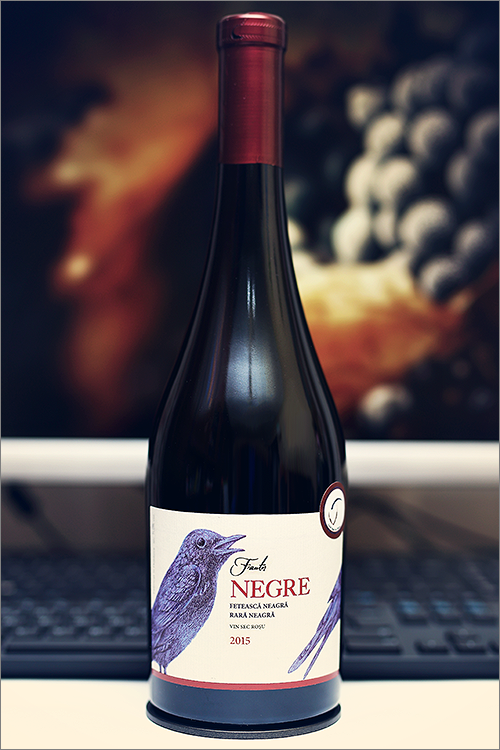 Tonight we are going to perform a trip into the past and re-evaluate a wine that we’ve already reviewed before – Negre 2015 from F’autor Winery. This is a wine that we hold dear to our hearts, as it is a 100% genuine Wine of Moldova, made only with local, indigenous grape varieties – a wine blend of feteasca neagra and rara neagra, that has been aged for 6 months in new french oak barrels. We have already mentioned the enormous potential of those two local varieties, and it seems that we are now witnessing a historical rise in overall quality and popularity of indigenous wines. That said, let’s get straight to the tasting and find out how this wine has evolved in the bottle during the last 12 months since our last review! Deep and noble ruby color, deep and transparent, with pale copper shades towards the rim of the glass. The nose is strong, filled mostly with black fruits and spice: black cherry, black plum, dried cherry, blackcurrant, ripe sour cherry, ripe black mulberry, overripe blackberry, dried cranberry and black cherry jam. An instant later the nose is filled with notes of nutmeg, sweet tobacco, light roasted oakwood, red and black pepper, cherry tree wood and some nuanced hints of cinnamon. The wine is extra-dry, with high alcohol level, high acidity and ripe tannin. It feels ripe, extracted and bold, with a nuanced fruity accent. This is a noble, elegant and complex wine, as it tastes firm, seedy and a bit woody. The wine is quite structured and well balanced and it has a supple harmony between all its elements. It has a medium-plus finish and an balanced, seedy-spicy, yet velvety aftertaste. This is definitely a great Wine of Moldova and the overall rating says the same, with 91.1 points scored it is right there, among the best wines we’ve tasted so far. Please click on the chart icon on the left in order to get to the wine rating page, where you can find all the wines we’ve tasted to date. Conclusion: this is a wine that is over its prime form, as in our view it has already started its decline phase. We recommend to drink it now, and not submit it to any more bottle ageing, as it is always better to drink a wine a year too soon than a day too late, which is exactly the case, as proven by our tasting experiment. Despite its slight descent, it is still a great wine: noble and elegant, with velvety spiciness and an appealing fine-tannic grip on the mouthfeel. Last time, due to the wine’s rustic-gamey hints, we’ve recommended to pair it with meaty dishes rich with irony notes, this time though, we would suggest to pair it with spicy meaty dishes rich in umami flavours, like for example tournedos rossini beef medallions with foie gras and truffles or a grilled pepper steak, in order to complement the spicy accents in the wine. Enjoy!